I’m working on a project taking a fresh look at our relationship with Europe. During the course of 2019, I’ll be researching and travelling to three cities, each illustrating an aspect of the trends and challenges facing Europe. Cadiz, reputedly the continent’s first city, represents Europe the old, a microcosm of Spain in its heyday but now in economic decline. Tallinn, capital of the Baltic tiger Estonia and one of the world’s most digitally advanced societies, exemplifies Europe the new. And Albania’s Tirana, with its multi-ethnic population and ambition to join the EU, embodies Europe the aspiring. The idea crystallised suddenly out of what must have been my version of Brexit grief, a slow-moving subterranean current carrying feelings of loss, helplessness and yearning for something I had always taken for granted. The travel plans I’d been hatching for distant lands suddenly lost their allure, to be replaced by a new curiosity about the Other that Britain was moving away from. What was this this geographical-cultural entity that I was missing already? Did I – and my fellow Britons – really know it? My new-found fascination was matched by a recognition that our relationship with Europe was shifting, and that the change engendered a new need to know it. So I’ve chosen to explore some of the continent’s lesser-known cities, all of which are in some sense lie at Europe’s edges. The material I gather in Cadiz, Tallinn and Tirana will eventually become a book entitled – probably – A Tale of Three Cities, telling the story of Europe at a key point in its evolution. As I go, I’ll be sharing some of my findings, including the odd travel tip, with subscribers to my newsletter. You can sign up below. In the meantime, I’ve started a group on Facebook where those who share my sense of disorientation can discuss the things that are getting left out of the political debate about Brexit. 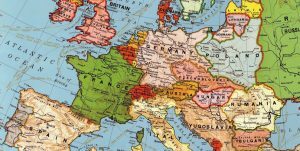 ‘Evolving Europe’ is a place to share experiences and insights about our changing relationship with the continent, as well as celebrating some of its little-known corners and customs. If you’re on Facebook, feel free to request to join.